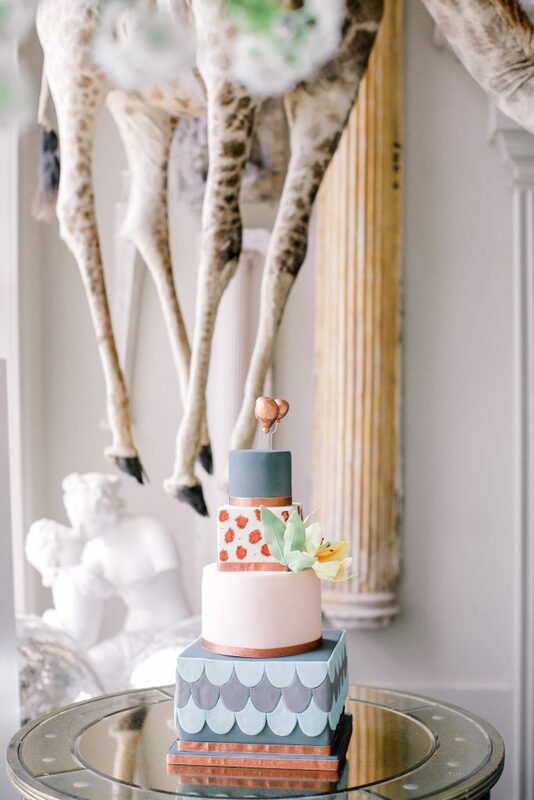 It’s not often that I have the opportunity to share a new wedding cake with you – these days, my schedule of touring with Foodies Festival means that I am mostly unavailable in wedding season! I am tricky to book but I do still love making bespoke wedding cakes. 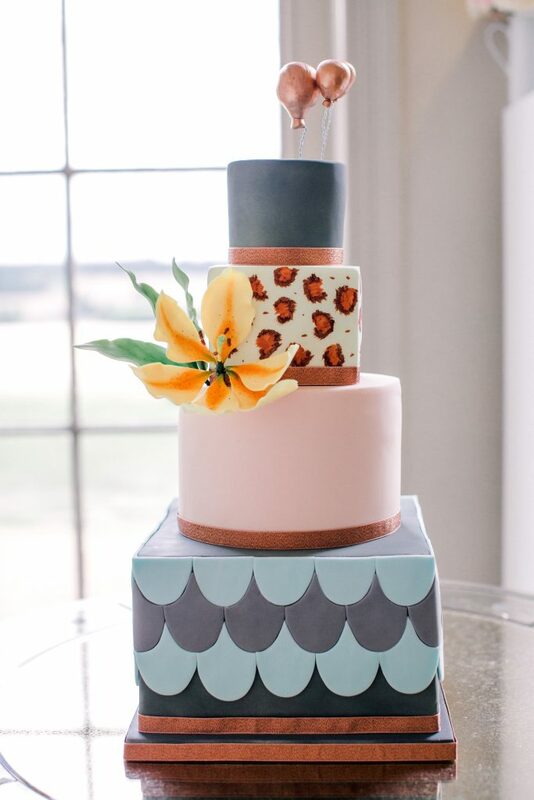 For James and Nicole, I was lucky enough to have a fabulous couple who knew what they wanted and FINALLY get to achieve my dream of making a leopard print cake! 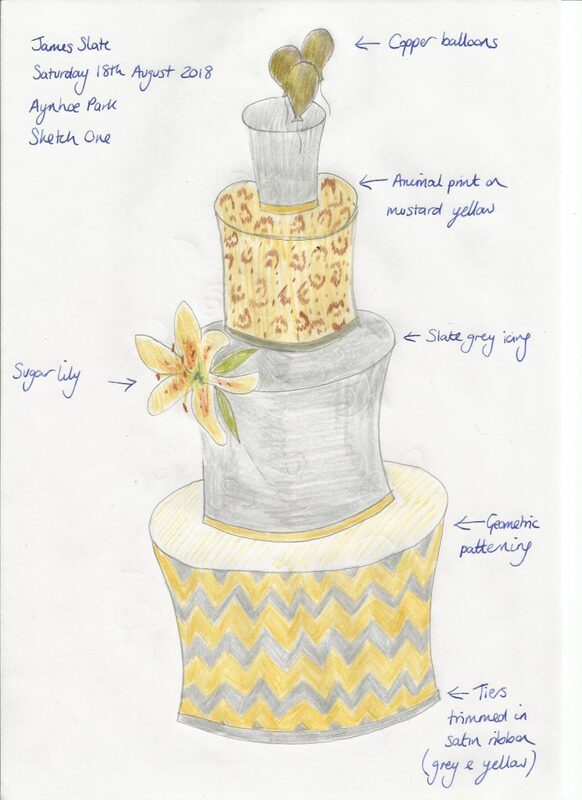 My first concept for the cake, working with James and Nicole’s brief ‘Jungle Eleganza’ featured a geometric pattern on the bottom tier, tied in with a two-tone colour scheme of yellow and grey. 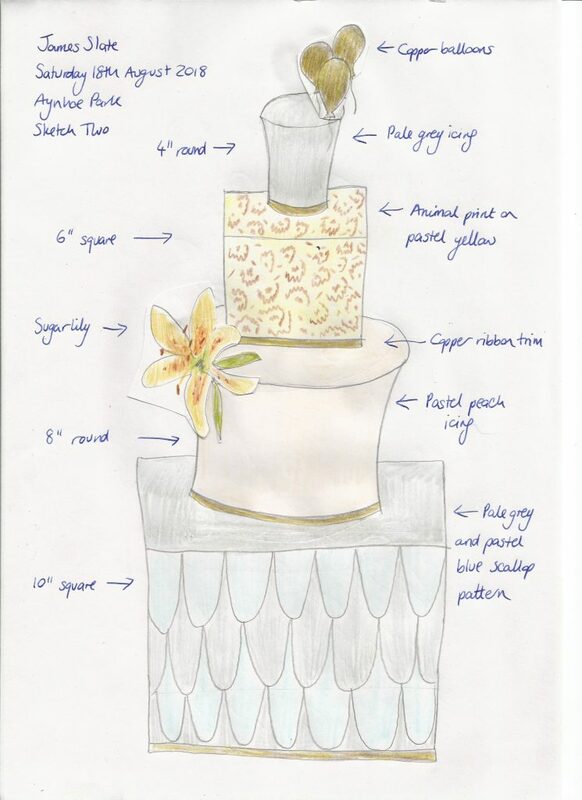 James and Nicole wanted to add more colour into the palette and Nicole had an idea of combining square and round tiers. 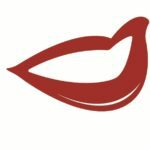 I returned to the drawing board and came up with a second draft of the design. 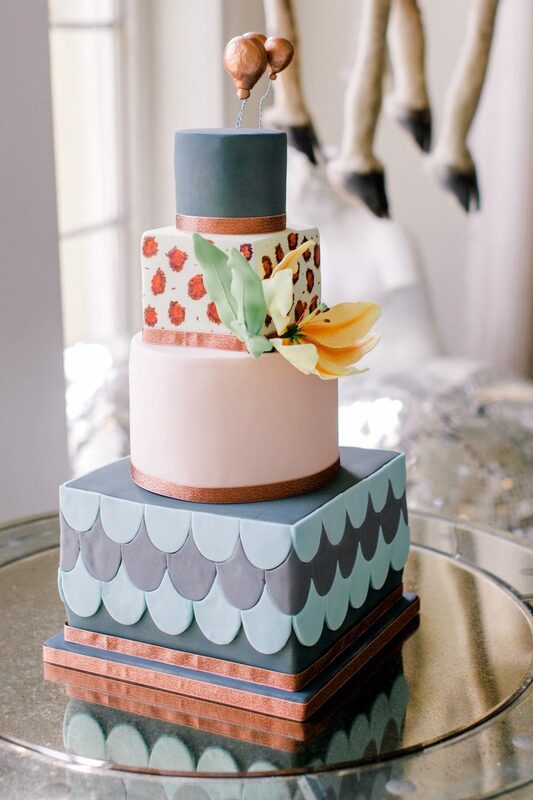 Pastel peach and blue detailing and a scalloped geometric design combined with the elements that James and Nicole already loved from the first sketch. The yellow tiger lily and copper balloons were set to tie in with the stunning surroundings of Aynhoe Park. I thought this cake looked great in its eccentric setting. Yes, that is a stuffed giraffe. 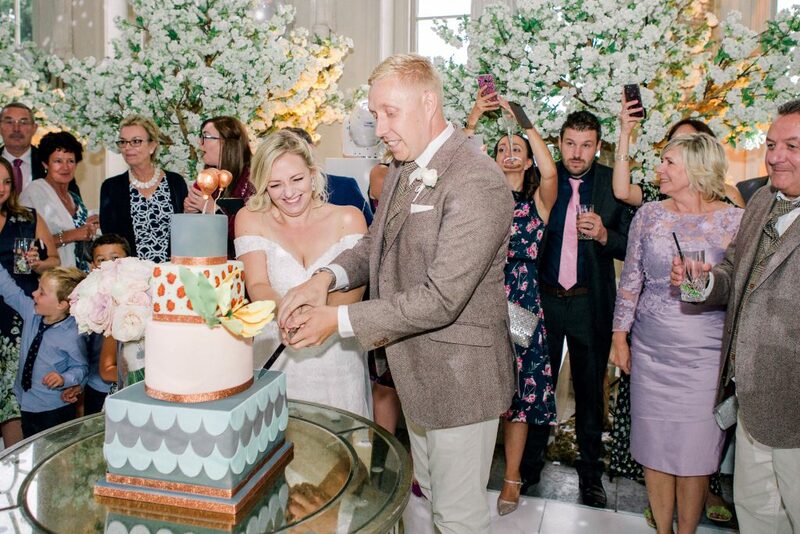 My favourite bit of any wedding cake design is the photograph I receive of a happy couple cutting into their cake. Cake is there to be eaten and enjoyed and I am sure that the mammoth Chocolate Mud Cake tier that James and Nicole are slicing into will have gone down an absolute storm with their guests. If anyone wants a leopard print wedding cake, call me!